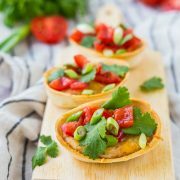 Ridiculously easy and perfect for game day, handheld refried bean dip is a hearty appetizer that everyone loves. Let your guests add their own toppings. Disclosure: This post is in partnership with Old El Paso and Target. Thank you for supporting Rachel Cooks by reading about brands we love and use in our own home. Do you all have plans for the BIG game yet? I’ve heard they don’t like their name used and that they’re super strict about copyright (keep that up and no one will be talking about you…seems strange to me!). Anyways…the game that shall not be named (s-u-p-e-r….b-o-w-l) is quickly approaching. We don’t have plans yet, but I’m thinking maybe I should host! I absolutely love entertaining in our new house. The kitchen has a big island that everyone congregates around and there’s a good flow between the kitchen, dining room, and living room. It’s open and perfect for entertaining. Right now our basement is completely torn apart but I’m looking forward to having that space as well. Whether we move the whole thing down there or just spread out a little (I’m picturing sending all the kids down there! ), it will be nice to have that option for extra space. And since I’ve been sharing lots of party-friendly appetizers (toasted ravioli! pizza sliders!) that are perfect (one could say SUPER perfect), I think I probably should give those all another run on an actual game day. Add this refried bean dip to the roster and everyone would be happy (super happy?) 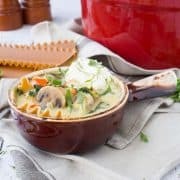 and full of hearty, satisfying appetizers. One of the things I love about the refried bean dip is how easy it is to make. 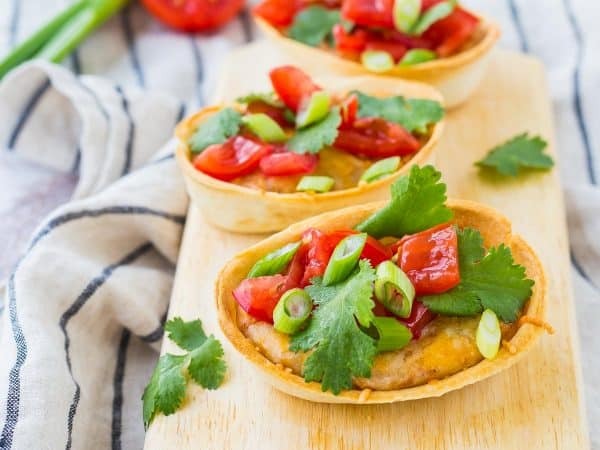 Now, you could bake this in a baking dish and use chips, but everyone is going to love the presentation in Old El Paso Mini Taco Boats. 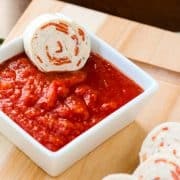 Gone are the days when you have to worry about your chip cracking in the bowl of dip. Everything is in one neat little package ready to be devoured. The tortilla is crispy around the edges to satisfy that need for a crunch, but on the bottom, it’s soft and tender, just the way a tortilla should be. 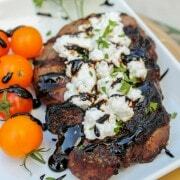 You could top these and have them ready to go, or you could let your guests top them just the way they’d like. Either way, you’re going to see a lot of happy faces. Preheat oven to 350°F. In a medium bowl, use an electric mixer to beat cream cheese until smooth and slightly fluffy. Add Old El Paso Traditional Refried Beans, chili powder, cumin and cayenne powder. Beat until combined. Stir in 1 cup of shredded cheese (reserve 1/2 cup). 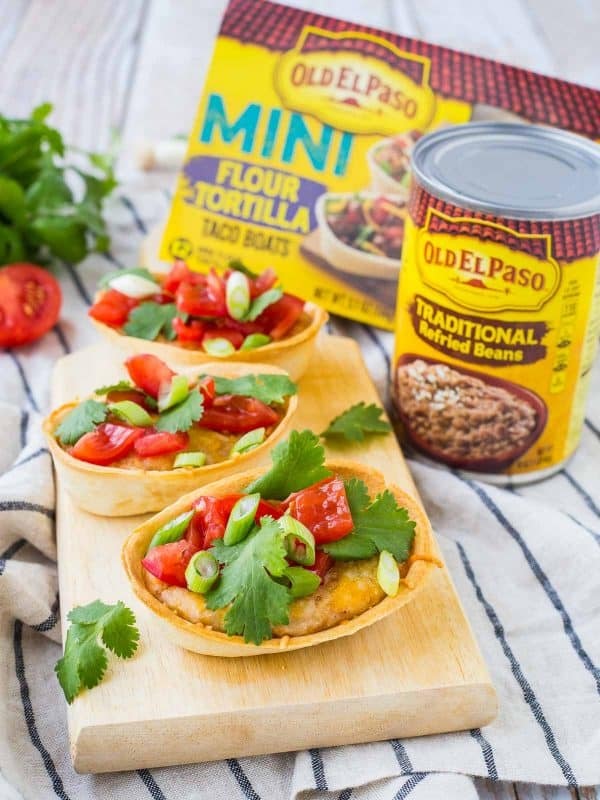 Place Old El Paso Mini Soft Tortilla Taco Boats on a rimmed baking sheet. Spoon or pipe bean mixture evenly into Mini Taco Boats and press down slightly to fill boats evenly. Sprinkle with remaining 1/2 cup of cheese. 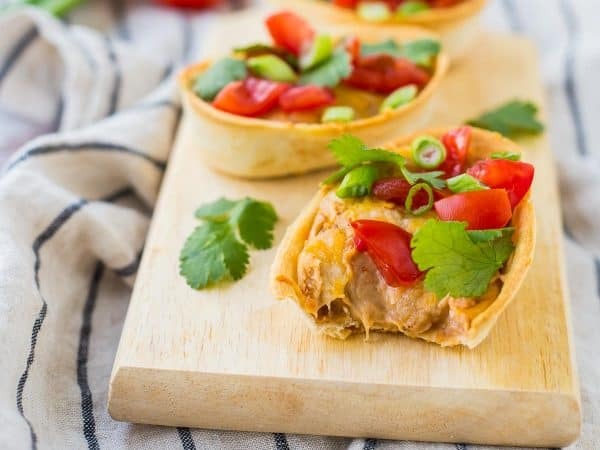 Bake for 12 to 14 minutes or until cheese is melted and tortilla boats are crispy and golden brown. Tip: Taste bean mixture before filling mini boats. Season as needed. If you like it spicier, add a pinch or two of red pepper flakes or more cayenne. Verdict: I absolutely loved these – we’ve been known to make a lunch out of them. Husband’s take: He loved this refried bean dip and he’s not always all the way on board with cheesy things like this. My daughter loved it too, and of course N doesn’t like anything so he turned his nose up at it (“I don’t yike that, Mommy”). Changes I would make: None are necessary, but have fun with those toppings! Actual nutrition may vary depending on how recipe is prepared. Nutrition info does not include toppings. 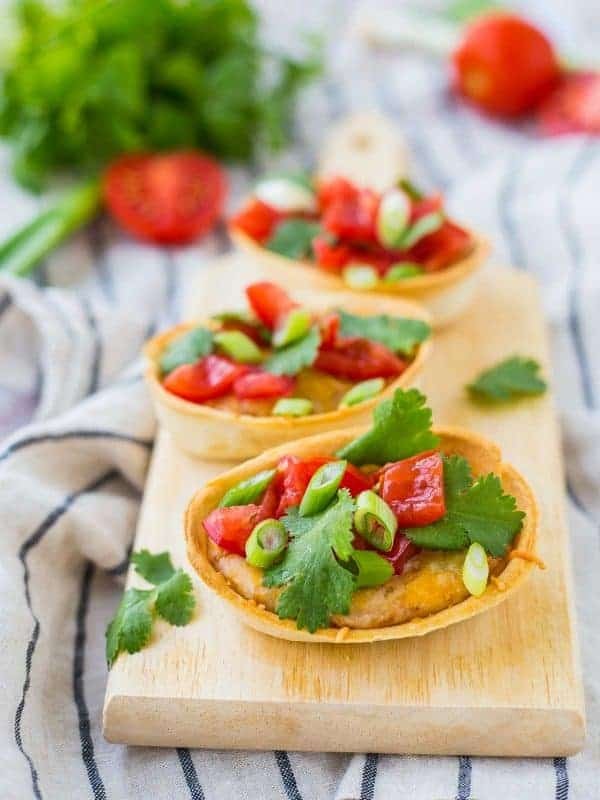 I have been wondering how to use the little tortilla boats! Sounds great for game day! They have so many fun uses! These are so great! And you should host! We have been asked by our son to keep it just us so he can focus on the Falcons–isn’t that funny?! He is 11. Oh well, we will see if that plan pans out–I am all party! Perfect: everyone can make a combination for their own ! Great creation. Thank you and have a nice day ! I just can’t get over how much I want to eat this. Looks great! Perfect bite size treats.